– Will you condemn Hamas and Hizbullah? – No! 2- Brainwashed Palestinians and Lebanese? 3- They hate Jews and Israel that much? In my opinion, none of the above. I believe it’s simply a matter of perception, and a fundamental fault in the question itself. While for the average person in Israel and most western and eastern civilizations Hamas and Hizbullah are merely terror groups that launch rockets on civilians and aid Assad in killing Syrians, to the average Palestinians and (South) Lebanese, they are governments, institutions, people they know personally, and education and healthcare providers. And to the average Arab outside, they are the only voice they know to oppressed nations they strongly relate to, bullied by a seemingly western nation. A scenario that in many ways reminds them of European colonial rule over their land. Despite everything that Hamas has done, it’s difficult to condemn it as a whole, specially for a Palestinian and those who relate to Palestinians in one a way or another, for the very same reason it’s hard to condemn the U.S despite Iraq, Vietnam, and Afghanistan, for Americans and those who strongly relate to America. The same is true for Israelis and those who relate to Israel, despite how they feel about occupation and its ripple effect. Why do we expect to Palestinians to condemn Hamas, and get angry when they don’t, and yet we understand when an American or Israeli refuses to condemn his own government and country ? The answer is usually “Because Hamas is an organization, unlike Israel and America” . Well , it’s an organization/terror group only to you, not to them! People tend to jump to the conclusion that not condemning a state/organization means condoning and full support to all actions of the said state/organization ( the way they perceive it to be) while that is rarely ever the case. When the question is phrased differently, answers often differ dramatically . I have rarely ever met a Palestinian who is happy about Qassam operations that often lead to death of thousands of Gazans in certain retaliations, nor have I met one who condones suicide bombings and stabbing of innocent civilians. Likewise, I have rarely ever met an Israeli or non Israeli who is happy about the status quo, and most either want two states or a bi-national state as way to resolve the conflict. 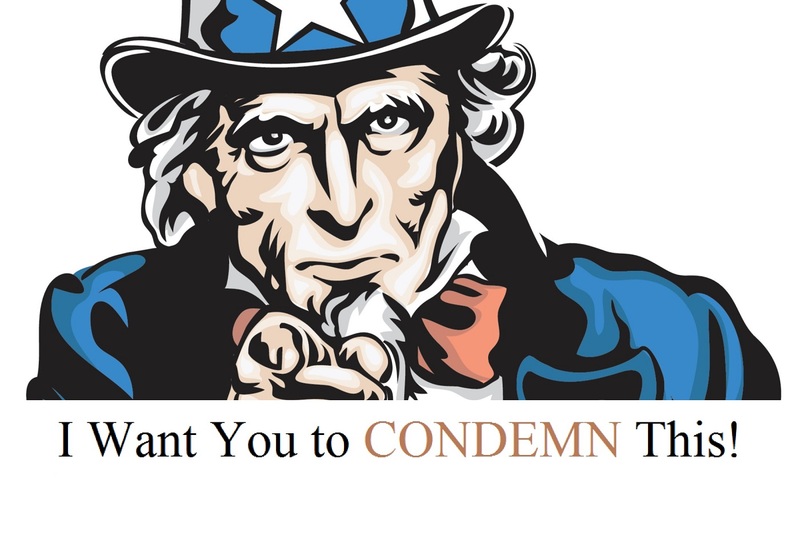 We ought to stop demanding condemnations so frequently, because it’s often an unfair demand, and the body we ask people to condemn is often very different one for the person on the receiving end of the request. I condemn MY Hamas, MY Hizbullah, MY Bennet, MY Bibi, MY Al-Bashir, MY Al-Sisi and MY Bush(es).. but you don’t have to condemn yours – they are not the same people/organizations anyway.